Mute is a mess. Its intriguing as all hell, but it’s still a mess. It is a film I’m happy was allowed to exist but at the same time I wish it was better. 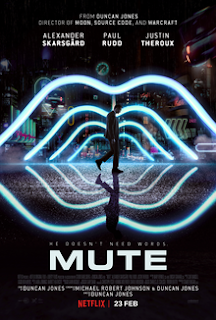 The plot has a mute bartender trying to locate his missing girlfriend in a neon dystopia of the future. He ends up meeting all sorts of odd characters on his trek to find the one he loves. I apologize for being less than forth coming with details but while there are complications, most of the interesting stuff is not in the well-worn plot but in the window dressing of a world like our own but different. I mean in the techno- world one character is Amish. I was in love with all the visuals. As for the plot not so much. Its wildly quirky (Amish) and strives to cover over the sense of being here before with showy stuff. Paul Rudd’s character is a genuine character, wild and crazy. You’re not sure what his deal is because, intentionally, you can’t get a bead on him until a bit of the way in. Writer director Duncan Jones gives us a lot of characters and it’s nice to see all these people on screen, but they really don’t do much. They come on show us their ticks and then get off. While the reasons for the film is to explore the disappearance you really don’t care after a while. I was about half an hour in when I realized I was starting to do something other than watch. There simply wasn’t enough real plot to keep me watching undivided. In away if I didn’t want to know hot it ended I probably would have turned it off before the end credits. Visually interesting but not much more.